“I was expecting a hellscape of long lines and sold out vendors….but no! 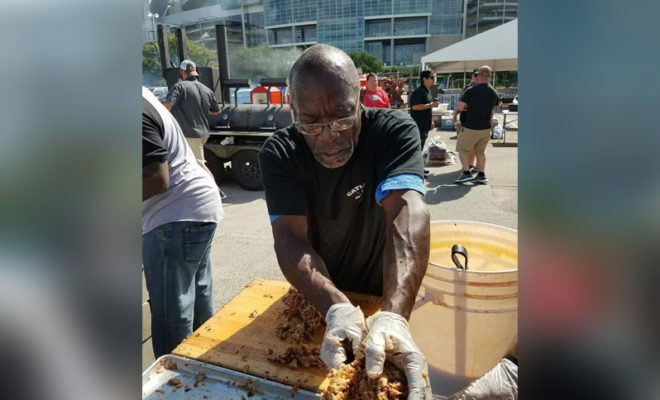 I’m torn–I want this to be a bigger event because it’s so fantastic, but I want to keep it low key because we waited no longer than 5 minutes in any BBQ line,” Stefanie Phillips wrote on the Houston Barbecue Festival Facebook page. In its fifth year, this Texas festival celebrated another major success on April 9th at NRG Park next to NRG Stadium. Chron.com says that about 2,300 people attended the fest that was founded by J.C. “Chris” Reid (the Chronicle’s own barbecue writer) and Michael Fulmer. The sunny day welcomed visitors who were able to sample 26 different barbecue stations featuring different businesses. Samples were unlimited, so people could chow down to their heart’s desire. The event was sold out, but guests still didn’t have to wait long to sample the favorites this year like duck wrapped in bacon from Pinkerton’s and smoked goat and pig from The Pit Room. If you missed out this year, and don’t want to make the same mistake in 2018, keep an eye on the Houston Barbecue Festival Facebook page and their official website.